The view on my bike ride to work this morning, originally uploaded by Michael A. Lowry. The past two mornings, I have bicycled to work. It’s a fifteen-minute ride up the gentle slope of Alte Landstrasse. 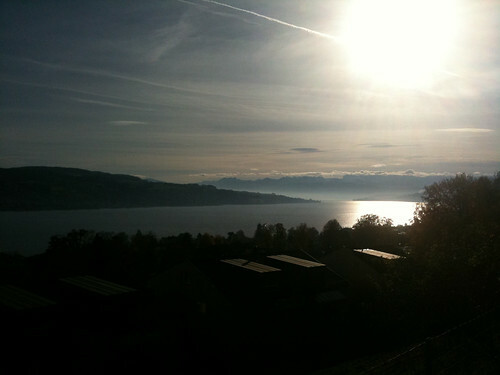 When the road passes through the southern part of Kilchberg, it offers a stunning vista of the Lake of Zürich. This morning the sun was shining brightly and there was a thin veil of haze upon the lake to the south.